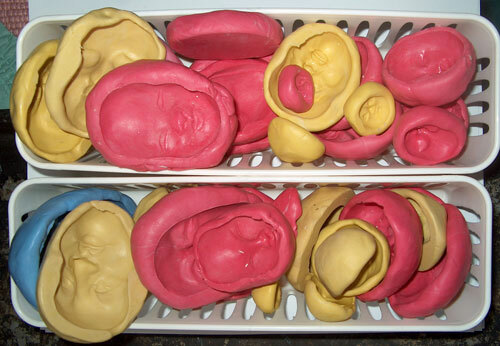 Molds can be made out of plaster, rubber, metal, silicone, and polymer clay itself, of course! 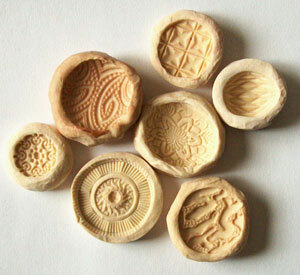 Stamps are a kind of tool that makes repetition in clay or ink a snap–and molds do the same job in reverse! By pressing a textured or dimensional object in a mold material and allowing it to set or curing it with heat, a reusable negative-image tool is formed. One kind of polymer clay especially made for making molds was Super Elasticlay, manufactured by Polyform and sold in 8oz. bars. It was much softer than the other clays, and took an impression well. It was kneaded up for a minute or so to prepare it for use. It has been replaced in recent years with a product called Sculpey Mold Maker/Elasticlay. I have not had good results with Sculpey Mold Maker. Elasticlay will not harden until it is baked, and many original pieces may not withstand baking, so it is advisable to remove the object by pulling it cleanly up and away from the mold. Elasticlay molds remain flexible for a while, but harden over time and will crack with heavy use and age, particularly in a dry climate. The face mold shown below shows drying and stress cracks. The button molds take less pressure and have survived fairly well over 15 years. Oiling the clay molds lightly with vegetable oil is helpful in maintaining the molds and keeping them from drying out. I use a soft paintbrush to apply it. (not shown here). PAM, a vegetable oil spray, can also be used but I find it messier to use; the coating is too heavy. 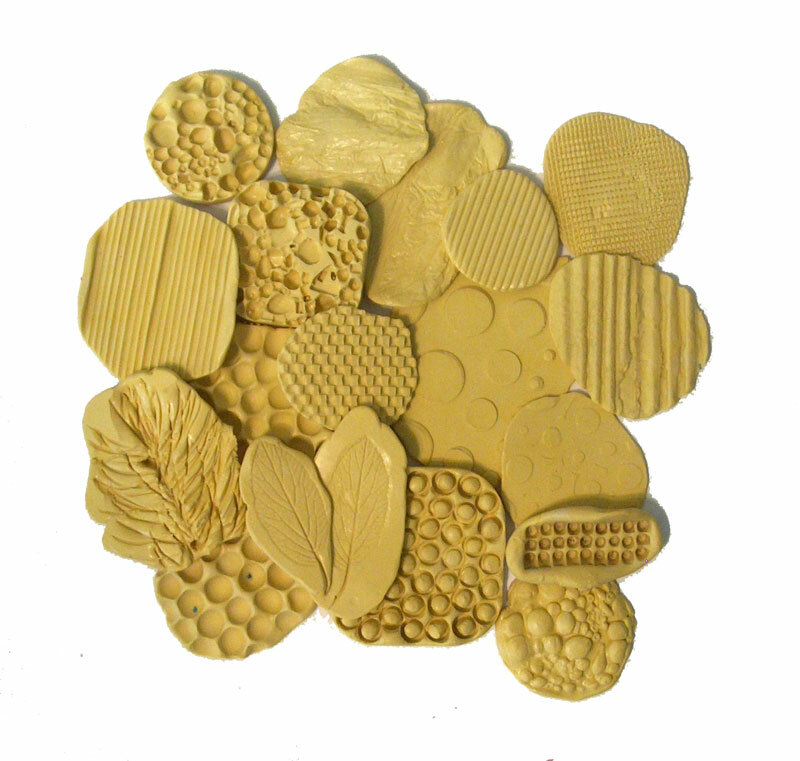 When using Elasticlay or polymer clay to make a mold, the original piece to be cast must be treated with a mold release such as talcum powder or cornstarch. Brush it all over the object including the edges, then press the piece onto a like-sized lump of Elasticlay or polymer clay placed on the work surface. Do this smoothly, without rocking or setting it at an angle. This takes a bit of practice! 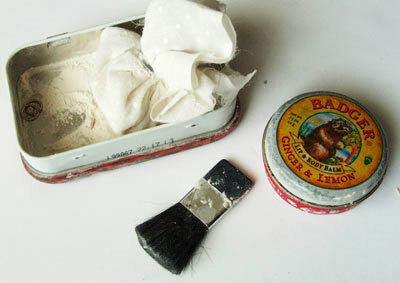 When using powder as a mold release, I use a small makeup brush and an old mints tin to keep the powder contained. A “ponce bag” is also very useful for powdering flat areas. This bag is made with a square of fabric that has an amount of powder placed in the center, then the edges of the fabric are brought up together and a rubber band is used to hold it all together and keep the powder contained. Rub this very lightly on flat surfaces to apply powder. Corn starch can also be used instead of talcum powder. Water used in a misting bottle can also be used as a mold release when working with polymer clay. I have successfully used Badger Balm, an olive oil based skin care product, in revitalizing very old and dry Elasticlay molds as well as using it as a mold release. It also works very well with silicone molds when using ceramic clay instead of polymer clay to cast pieces. 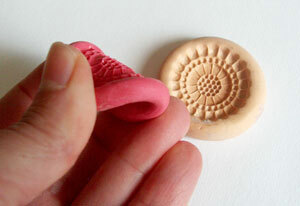 Elasticlay and other polymer clay molds are not flexible, while silicone molds are. All take detail well. Only the silicone molds remain flexible. 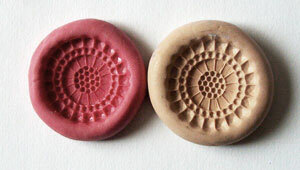 Below are shown two molds from the same button made with silicone and polymer clay. When making molds, check to see that you have a clean impression–if not, wad it up and try again. Polymer clay or silicon rolled out flat into sheets can be textured with stamps, lace, pasta, wires, and all sorts of items to make texture sheets for transferring your own overall / large scale patterns to clay. Flat sheets have the advantage of being flexible enough to wrap around contoured objects, or to go through the pasta machine with polymer clay sheets. Shown here is an assortment of texture molds made by my clay buddy Karla. My molding compounds of choice are two part silicone molding materials. There are many brands on the market, and each is a different color. In this photo, blue is Alley Goop, pink is Miracle Mold and yellow is Amazing Mold Putty. AMP is available at Hobby Lobby and other craft stores. No matter which brand you use, it comes in two separate containers, and the silicone and the catalyst are mixed together in equal parts at the time of use–mix till the colors blend to a uniform solid, and then press the item to be molded into a smooth ball of the silicon mixture. No release agent is ever needed when using the finished molds with polymer clay, wax, soap, or food like chocolate. However, when using them with ceramic clays, I find a very light coating of Badger Balm to be necessary for a clean pull. When making a mold with silicon, check to make certain that the item is cleanly embedded but don’t rock it or move it around. The silicon material begins to set up VERY quickly, and in just a few minutes becomes too stiff to take as clean an impression, so it is important to mix it up in small batches that are going to be used immediately. Depending on the size of the cast item, it will take between five and thirty minutes to set up completely. The finished silicone molds stays very flexible and they will “pop” right off the item being cast. Clay can be baked directly inside these molds (this includes the liquid polymer clays), or raw clay pulls can be popped put easily and then altered before baking. 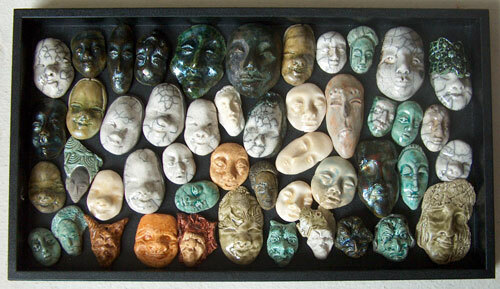 I like the molds I make with this stuff so much that I re-cast all my button molds and faces using it, and have used it to create all my new molds for several years now. Pulls from both the button molds and the face mold shown at the top of the page were made using a pale terra cotta colored clay. Details with more clay were added and the piece was baked to form an original that is also a first generation repeat of the original face and buttons. This piece was cast in the silicone Miracle Mold as well. Now I am able to make many repetitions or “pulls” from the mold and decorate each in a different way. When a small irregularity in a mold–whatever its composition–occurs, it still can be a valuable tool. There is a slight flaw around one of the eyes in this complex mold shown above but it is quite easy to smooth that out before baking. The first piece on the left (of the four above) is the original used in making the mold. It has been stained with black acrylic paint, Varathane, and copper Pearl-Ex Powder. The other three faces are pulls from the mold. Though two generations away from the original face, the detail is still clear. Different colored clays, powders, paints and stains are used to give the different finishes to each. 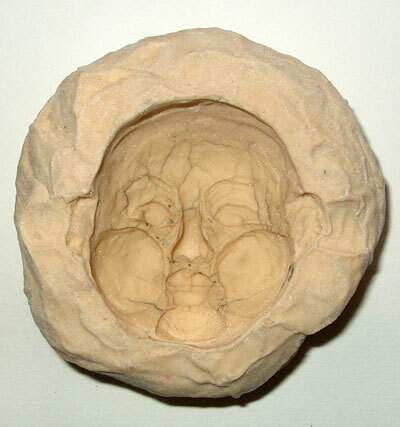 The faces shown below are pulls from the silicon mold of the original face. The first face on the left is direct from the mold with no smoothing. Very little clean-up is required with these molds. Notice how a little acrylic paint, mixed with Varathane as a binder, really changes the look of the features! The amount of “makeup” applied to a baked face changes the character’s look–go from innocent to high fashion complete with slick lip color and eyeliner…its all in the application, done in steps and layers. Making large and complex molds does use up a lot of molding material, and also offers more opportunity for small errors. Its a good idea to practice making molds for a little while with clay before moving up to silicon. Even now that my mold-making skills are in good practice, I like to try the larger pieces like doll faces in polymer clay first. This allows me to see how the pull from the mold will look—sometimes I don’t like it enough to commit it to silicone, and its easy enough to check it first, then remake or remodel the original piece as needed! I highly recommend taking a look at the resources and information at The Compleat Sculptor. You can find more links to suppliers here. It is well worth the investment for the serious professional who wants precise detail in their casts, and also for those who work in other media like PMC , ceramics or paper.